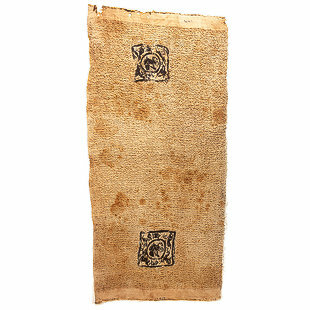 The cotton towel has a downy surface and two squares with similar ornaments of brown wool. The ornamentation depicts a scene of a hunting trip. In the center of each square is a warrior and in the space between the center and the square are four small animals, a lion, a dog, and two rabbits, surrounded by geometric decorations.